Warm welcome to Peter Harris! It was a nice surprise for me to get a problem from a well-known fairy composer from so far South Africa! No.39 – hs#3 by Peter Harris – a nice and seldom synthesis between two modern fairy conditions with many typical effects. AntiCirce (Calvet – the standard type): After a capture the capturing piece (Ks included) must immediately be removed to its game array square (necessarily vacant, else the capture is illegal). Captures on the rebirth square are allowed. Game array squares are determined as in Circe. AntiCirce (Cheylan): As antiCirce Calvet except that captures on the rebirth square are not allowed. Isardam: The moves causing a Madrasi – like paralysis are illegal. This holds right up to the capture of the mated King. This is standard form of Isardam. Madrasi: Units other than Ks are paralysed when and for as long as they attack each other. Paralysed units cannot move, capture or give check, their only power being that of causing paralysis. For SOLVERS: you can Click here to hide the solutions, and then do it again – to show them! This difficult and interesting problem is one of the best works of the famous composer Peter Harris in recent years! In my opinion, here some more detailed explanations are needed – for readers with a modest practise in fairy genres. We begin the analysis observing the positions of both kings. A) Ka8 is not under “check” because: 1.Bxa8?? is an illegal move (according to Anti-Circe rules) because the rebirth square for the white Bishop – f1 is occupied. For this reason an illegal move is also 1.Sxc7?? because the square b1 is occupied. Not possible is also to play 1.Qxa8(Qd1)?? because (according to Isardam rules) after this move occurs an illegal paralysis between Qd1 – Qb1. On the same grounds is illegal also 1. Rxa8 (Rh1) – with an illegal paralysis between Rg1 – Rh1. B) Kg2 is not under “check” because: 1.Rxg2?? is an illegal move (according to Anti-Circe rules) because the rebirth square for the black Rook – a8 is occupied. For this reason an illegal move is also 1.Sxg2?? because the square g8 is occupied. 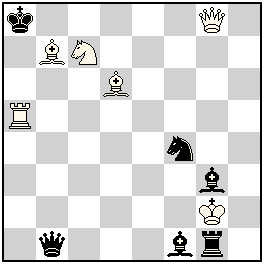 Not possible is also to play 1.Bxg2(Bc8)?? because (according to Isardam rules) after this move occurs an illegal paralysis between Bb7 – Bc8. a) 1.Ra5-g5 Rg1-h1 2.Sc7-b5 Rh1-h2 – now White can activate Bb7 after the move: 3.Kg2*f1 [wKf1->e1] +!! – A super interesting and surprising situation – now Ka8 is under check from Bb7 (the rebirth square for the white Bishop – f1 is free!). On the other hand, Ke1 is not under check from the black Qb1, because the move Qxe1(Qd8) leads to an illegal Isardam – paralysis! Black must play 3…Ka8*b7 [bKb7->e8] #! An unique final – here Ke1 is under check (mate) because now the move Qxe1(Qd8) is possible – as the line for the w.Qg8 is closed (from the black King!)!! Only now is clear the goal of the key-move 1.Rg5! – in the final the Rook blocks the square g5 and the move Qg8-g5 becomes impossible! Without Rg5 there is no mate here, because White has a defence: 4.Qg5!! and the capture Qxe1(Qd8) is illegal because of the Isardam – paralysis! In theoretical&practical aspect the last white move is very important: 3.Kg2*f1 [wKf1->e1] +!! – here we have a special kind of fairy – battery: Kg2 is forward piece, Bb7 is rear piece! (Juraj Lorinc named such batteries “ecto-batteries”, you can find many interesting materials about them on his excellent web-site. The link from one Juraj’s comment: http://www.jurajlorinc.com/chess/theo28tt.htm). 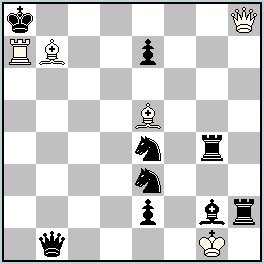 b) 1.Bg3-f2 Sf4-e2 2.Qg8-b8 Bd6-f4 – now plays the battery Kg2/Ra5 – 3.Kg2*g1 [wKg1->e1] +! – Ka8 is under check from Ra5 – the capture Rxa8(Rh1) is possible in this moment and follows: 3… Ka8*b8 [bKb8->e8] #! – Qb1 is matting – piece here. Impossible was 3….Kxb7(Ke8)?? because of the illegal Isardam – paralysis Qb1 – Qb8! An interesting question: what is the meaning of the move 1….Se2? Answer: it is a special Anti-Circe move which blocks square e2!! Without Se2 in the final position White would play 4.Ke2!! because the capture Bxe2(Bc8) is illegal according to Isardam rules! Of course, in this problem the both phases are not exactly equivalent in thematic attitude. But it is not a defect of this excellent composition which we can name “HS# of ANI – type” (ANI = problem with solutions which are not fully thematically identic). In this problem the combination of two fairy conditions works brilliantly! To the readers: Do you wish also to compose a problem with two conditions: Isardam+ Anti-Circe? That would be very interesting! Your perfect pattern example would be the problem of Harris! But my recommendation for a start is to try a realization only in two moves, for example: H#2, or HS#2. The combination of these two fairy conditions (each of which itself is difficult to comprehend initially) is so complex that I could not grasp the ideas in the problem fully. I realised the significance of the white move 1.Rg5 only after a few hours of analysis. Brilliantly done Mr.Harris ! Thanks to Petkov for his lucid explanation. There are some other intersting points but also some imperfections (complex content and overall economy may be excuse for them). in b) wBf2 blocks the flight and bBf4 guards d2. wP would block f2 just as well because wRa5 guards a7. But in a), the guard of b8 and closing the line d5-d8 are not the only functions of wBd6. It guards f8 and Isardam forbids bBg3 to capture on e1, because Anticirce would give rebirth to it on f8. So, wK may be reborne on e1 after the capture on f1. But why bB is on g3 in the first place – it prevents 4.Bd6xf4(wBc1) because now bBg3 attacs e1, since f8 is not guarded by wB any more. Since wBb7 and bBf1 are thematic in a), these artificial roles in b) are acceptable, but wS is a flaw. No.39 shows spectacular effects of combined conditios AntiCirce + Isardam, particularly richly in twin a). The potential of the thematic mechanism presented by Peter Harris seems great and deserves to be explored. I’ll try to analize and comment it, hoping that fairy experts will not leave my possible misconception unanswered. The theme which unites the two phases is realized through a complex main mechanism of ‘ecto-batteries’, combined with a simplier mechanism in which wQ and bQ prevent each other to capture or check. Both mechanisms use the AntiCirce or the Isardam, or their combination but not quite equally in thematic elements. wBb7 doesn’t check bK because bBf1 closes the line b7-a8(>f1), it’s the AntiCirce effect; wRa5 doesn’t check bK because h1 is guarded by the same kind of black piece – here bRh2 does not close, but actually extends the line affected by the combined AntiCirce+Isardam, so we must consider the combined effect on the combined line a5-a8>(h1)-h2. wK will capture bBf1/bBRh2 and AntiCirce rebirth of wB7/wRa5 will become legal. Important for the ecto-battery is the following: wK moves and thus activates the checking power of wBf1/wRa5 but wK does not depart from nor arrive on the mentioned lines. Now let’s look at the mechanism. wR and bR belong to one component of the mechanism, being thematic in one phase; wB and bBf1 belong to another component, being thematic in the other phase. There is no reciprocity between those two components of the mechanism, they are independant. In the phases when those pieces are respectively not thematic, they function in mutually very different way. Actually, wK>bBf1>wBb7>bK>wBb7>bK>wQf8>bQb1 makes one mechanism and wK>bRh2>wRa5>bK>wQ(! )>bQ makes another. Those two mechanisms differ even in the thematic play. wBb7 checks but it is also captured, so bK could arrive to it’s rebirth square e8 and prevent the Isardam effect of wQ. wRa5 checks but wQ is captured and the arrival square of bK is irrelevant, because the Isardam effect is prevented by the annihilation of wQ. The mates are delivered by black batteries. In 2…Kxb8(bK>e8)#, bK does not start from nor ends on the line b1-e1(>d8)-b8, so it’s an ecto-battery mate. In 2…Kxb7(bK>e8)#, bK arrives on the line b1-e1(>d8)-f8, so it’s an antibattery mate. Reciprocity and interdependence help to unite several components into single mechanism. In 1st solution wBb7 and bBg2 play and actively form an Isardam-pin, then wK captures bRh2 and activates the ecto-battery check by wRa7 which is then captured by bK which thus arrives to e8 closing the Isardam-line d8-h8 (2…Rg4-g1?? is prevented by 1st w&b moves). Initially, the checks by both wB7 and wRa7 are prevented by the Anticirce+Isardam effect. Other possibilities for an extension of the mechanism might be a challenge for composers. [You may if you wish put any or all that I have written below on your site]. versions each with two solutions. board and the Kings in the midst of the enemy, assailed from all sides. example. I hope other composers will make better AntiCirce + Isardam problems. When conditions are properly combined I think the effects can be that 1+1=3. I am grateful for your comment, it describes your delicate feeling of the thrill and dynamic in a chess problem. I rarely compose or solve fairies and hardly ever look at the problems with combined conditions. I certainly requires a lot of time from the inexperienced to understand what’s going on. First I was attracted by the position, so I looked at the solution. Then I was intrigued to comprehend all details and eventually thrilled with the overall magic. If I ever start to compose the complex fairies, it would be greatly due to you and this problem. Thanks! In my example (4+7), I significantly reduced the dynamic and thus the thrill of the original, in order to put the thematic mechanism in the focus. One goal was to discuss the fairy batteries and the other goal was to explore the potential of the very mechanism. My version (5+9) has a weakness in bSe3 and bRg4 which are only the cookstoppers in one phase, respectively. Could this be improved or just tolerated? The position is not very dynamic but the mechanism that switches the functions seems to work fine. It’s a kind of inner ‘dynamic’ of a chess problem. [In my original problem both Ks are observed by a R, B, S. I liked this feature]. Preliminary moves that are lost when a problem is “compacted” can mean the loss of important features. A problem can have more to it than just “intensified effects”. [The fact that in the present case the intensified effect needs partially used additional pieces is another matter]. In my original there are moves that simply have no counterpart in the shortened version. There are various approaches to chess problems with various preferences. I have used or missused a potential of the basic scheme of No.39, to present a different approach. A reference to the original author was a clear obligation but comparing the two presentations/interpretations of the scheme is not very reasonable – it crutially depends on the approach and preferences. There is no time and space for long explanations of what I prefere, why wK is not at h1, which preliminary play I find interesting and which not, why do I find the moves 1.Ra3/1.Bc8 much more interesting and complex for solvers than 1.Rg5 etc. Partially used pieces are indeed a serious weakness and I’ll be glad if someone can improve that, retaining the content. My authorship is not important, I would not mind if the “version” could have been published without my name.